Doctor Who: Revisiting THE TALONS OF WENG-CHIANG | Warped Factor - Words in the Key of Geek. On the eve of its 40th anniversary Andrew East revisits The Talons of Weng-Chiang. 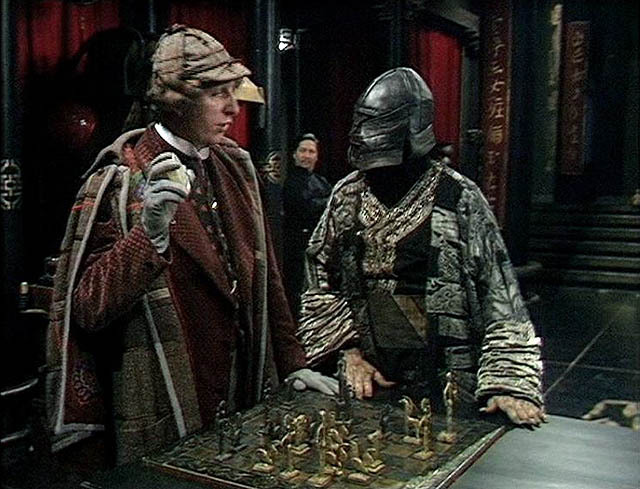 The most quintessential and famous example of Victorian-set Doctor Who, The Talons of Weng-Chiang is one of those stories which has gained legendary status. 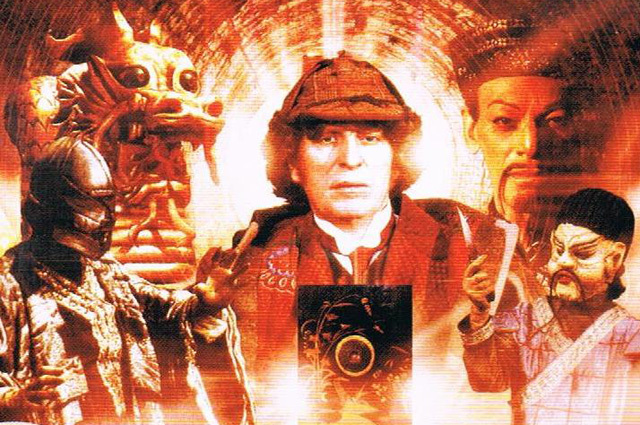 It consistently comes in the top ten of any poll and has spawned possibly more spin-offs, sequels and linked stories than any other Doctor Who adventure not featuring a classic ‘monster’: The Shadow of Weng-Chiang, The Bodysnatchers, The Butcher of Brisbane and of course 12 box sets (so far) of Jago and Litefoot. 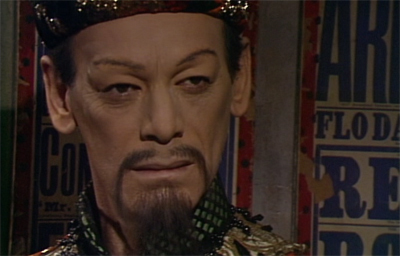 Something about The Talons of Weng-Chiang sits well with how fandom considers Doctor Who should be. A well-realised historical setting; unsettling vllains; a pitch perfect Tom Baker; well-scripted and performed supporting characters; a good plot; exciting set pieces and a effectively sketched backstory: all these make to produce something a little bit special. Oh yes, and a giant rat. I’ve always enjoyed this story, but watching it for this retrospective I started to find some things which bugged me a little. Maybe it’s a case of familiarty breeds contempt. This was possibly the first VHS I ever bought (the memory is a little hazy) but I distinctly remember going into my local branch of Our Price (blimey, who remembers them?!) and choosing Talons. And why did I choose it? Was it the stunning cover (a rather odd shot of Greel and the large dragon from the climax of the story)? Was it the intriguing blurb on the back? No, it was the fact that it had the longest running time of all the choices available and felt like more value for money! Talons does justify its running length, though. It doesn’t feel padded at all. The opening of the story concentrates on the mysterious goings-on at the theatre, with the focus on Chang and Sin, before the middle episodes move the focus on to Greel and his plans, before the final episodes shifts to the growing bond between Litefoot and Jago. The expanse of the story is quite epic; from the theatre to the back streets of Limehouse; the police station to Litefoot’s mortuary and home; the sewers and finally the House of the Dragon. However, I did find the set dressing to be somewhat lacklustre. The theatre is wonderful, but when we get to Litefoot’s house I just felt something was lacking. Comparing it to Gabriel Chase from Ghost Light, for example, it seemed drabber and less interesting. Maybe Litefoot’s abode is closer to what true Victorian interior décor would have been. The House of the Dragon has the very impressive dragon as its centrepiece but the rest of the ‘house’ is a little sparse. 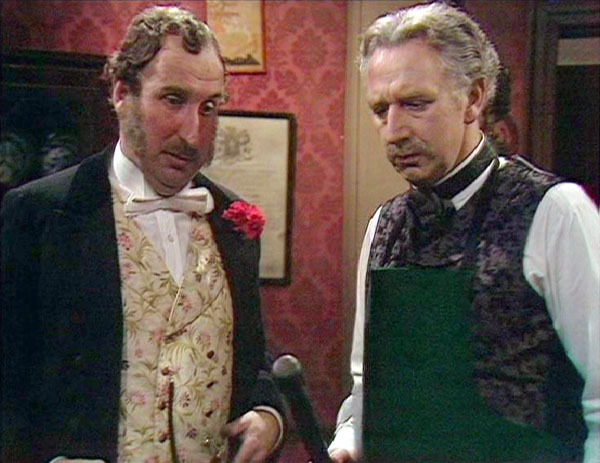 Roger Murray-Leach, on the extras, confesses they had run out of money by this stage of the production and that the walls of the house’s interiors are simply black drapes. Any criticism of this story is always centred on the Giant Rat, but I think, just occasionally, the set design lets it down a little. The performances are universally excellent, and if we tactfully ignore the arguable racism of casting John Bennett as ‘a Chinese’, he provides a great villain. In fact, I prefer Chang to Greel as he is a far more layered character. Clearly a gifted magician, someone who has been manipulated by Greel and who is ultimately abandoned. His final pathetic, drug-addled form is an interesting end for a character who has been an main antagonist for much of the story. Michael Spice’s Greel is saddled a little with ‘mad meglomaniac’ scripting, but there is also a tragic side to him which is more obvious at the climax when the Doctor is confronting him over his origins. Tom Baker is on top of his game in this story. He's settled in the role and we've not yet reached the stage where he started to let the eccentricity get the better of his performance. Louise Jameson is excellent as Leela, but it was interesting to watch one of her earlier stories and contrast it with the performances I’m more familiar with of late, particularly bearing in mind her ubiquity in Big Finish productions. This version of Leela is far more naïve and almost childlike. She seems incredibly fresh-faced, and whilst the ‘savage’ tendencies are at the forefront it was less of the ‘warrior woman’ seen in Big Finish’s Wrath of the Iceni, or the noble savage contrasted with the corrupt intellect of the Time Lords as seen in the Gallifrey series; but more the attitude of a young, inexperienced child who reacts to the world with violence and anger because she hasn’t been taught how to talk through a situation. The Eliza Dolittle comparisons are fairly obvious, particularly in her scenes with Professor Litefoot at dinner, but it is interesting how this ‘education’ of Leela has been developed in the Big Finish audios. Front and centre, though, of this story are Christopher Benjamin and Trevor Baxter as Jago and Litefoot. In the extras, Baxter points out that the duo do not actually meet until the final third of the story. As characters they are developed and established as individuals in their respective worlds, interacting with the Doctor and Leela, until finally coming together to fight Greel. It's no wonder that Big Finish leapt on the idea of doing a spin-off series with them. Their worlds and characters are so detailed and entertaining that it does seem like a no-brainer. In just the same way that fans often call for a spin-off with the Paternoster Gang, if fandom had been like it is now, back then, you can guarantee the forums would have been full of 'Jago and Litefoot Need a Series' threads. Benjamin and Baxter are superb. The scene where Jago confesses to Litefoot that he is actually terrified, is very moving (even if the audience has been well aware of this fact since the Rock of Gibraltar fainted in the theatre cellar and had to be dragged out by the Doctor); and Litefoot’s dinner with Leela is a delightful comedy of manners. Historically, The Talons of Weng-Chiang, as the extras point out, is more about the literary heritage of Victorian life than anything factually accurate. This story wears a lot of its influences on the sleeves of its enormous greatcoat: Sherlock Holmes; Jack the Ripper; Fu Manchu; The Importance of Being Earnest; My Fair Lady. The all foggy streets, murderous Chinamen, ladies of the night and mysterious foreigners. And very good it is too. It’s the sort of historical setting that the black and white historical stories were leaning to in their latter years: it’s reminiscent of The Smugglers and The Highlanders which were far more influenced by literary versions of history, such as Doctor Syn and Kidnapped, than the more factual approach of early historicals, such as The Aztecs or The Massacre. It’s probable that we could work through all the historically-set stories, both pure and pseudo, and separate them into ‘fact-based’ and ‘literature-based’ versions of history: even the modern series stories probably fall into both – contrast the ‘Agatha Christie murder mystery version of the 1920s (even if including Christie herself) from The Unicorn and the Wasp, against the more intense ‘Pompeii erupts’ of The Fires of Pompeii or the examination of Van Gogh’s depression in Vincent and the Doctor. Doctor Who does both of these types of historical well but they achieve different ends. Whilst The Massacre may educate us about history, The Talons of Weng-Chiang steeps us in atmosphere and draws on a cultural understanding of Victorian life perpetuated by continual adaptations of Charles Dickens, examinations of Jack the Ripper and even modern television series' which draw on Victorian tropes such as Whitechapel. Doctor Who itself continues to delve into Victoriana for inspiration with The Unquiet Dead, Tooth and Claw, The Next Doctor, The Snowmen, The Crimson Horror and Deep Breath spanning all 4 ‘new series’ Doctors; not to mention the Paternoster Gang providing a reason for the show to continually return to this time period. After watching the story, I listened to The Foe from the Future, one of the Lost Stories range from Big Finish. It is the story that The Talons of Weng-Chiang replaced, and so could've ended up being broadcast from February 26th 1977 instead. It does bear some passing similarities – a deformed villain from the future being the most obvious; but on the whole it is a very different story, not least because its main setting is ‘contemporary’ Earth with a journey to the future in the middle episodes. It was good, but I prefer Talons and I don’t think, if it had made it to the screen, it would be topping the chart polls in the same way Talons does, as it seems rather more generic. The Talons of Weng-Chiang is a quite wonderful story. Brilliantly written and faultlessly acted. It shows just what Doctor Who is capable of when spinning together disparate elements such as a time travelling dictator from a war-torn future with the foggy streets of Victorian London. Much as I disagree with fandom a lot on the relative merit of some stories, Talons is one where I have to agree with the consensus. A tour de force.